Since I will be away for a short while (*), I’d like to take this opportunity to wish everyone a great New Year and also to thank everyone who has shared with me this blogging… adventure: in this relatively short time (less than a year) I have discovered and learned so much! Not to mention encountered wonderful people that have enriched this experience. So, everybody! Have a great 2015! (*) no internet access, so I will not be able to reply to comments or contact forms, but I will do that as soon as I get back, promise! There’s always a degree of trepidation in facing the second book of a series when you’ve greatly enjoyed the first one, because as a reader I’m always aware of the possibility for disappointment. This second installment in the Parasol Protectorate series is just as good as the first, even though at times it seems to lose momentum. Probably the need to broaden and deepen the background in which the characters move is the reason behind this perceived slowness: despite this small… disturbance, Gail Carriger confirms her skills as a writer and has me now firmly among her admirers. When we left Alexia Tarabotti – now Lady Maccon – at the end of Soulless, she had newly married the werewolf Earl of Woolsey, and luckily for us a few months of marital bliss have not changed her quirky disposition or her sharp wit. 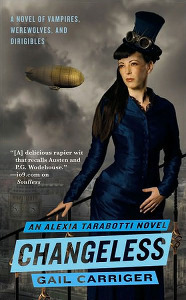 One of the reasons I enjoy Alexia’s character so much is that she is the perfect representation of a woman of her times, as far as behavior and adherence to social conventions are concerned, yet she also possesses an uncanny ability for sideways thinking and brilliant deduction, combined with a keen intellect she does not feel compelled to hide. Urban Fantasy and Steampunk, the two genres this series loosely belongs to (and I say “loosely” because I believe Ms. Carriger created a unique genre here), tend to present the readers with a stereotyped heroine who is indeed bold, independent and snappy, but also aggressive (sometimes unnecessarily so) and prone to foolishly unthinking behavior, the kind that would land ordinary people in a grave, while these characters manage to survive in miraculous ways that are a severe test for suspension of disbelief. Other characters from the previous book make an appearance, like Lord Akeldama, the ancient, eccentric vampire who has befriended Alexia, or Professor Lyall, Lord Maccon’s Beta and an interesting figure that I hope will get more space in the next books: to my disappointment these are just cameo roles, though, because most of the action takes place in Scotland where Conall’s former pack is facing a crisis of their own. The solution of the mystery is an interesting one, and it remains open-ended, so that the situation might present itself, in some other form, in the future. Yet the book closes on a negative, worrisome note: I am not going to offer any spoiler, as I always try to do with my reviews, but I’d like to state that while I had long suspected the nature of one of the final revelations, I was surprised by the reaction of a particular character, even though the reasons for it are quite logical – at least from his point of view. Alexia herself is placed in an odd situation, and what’s stranger still, she seems to react in a passive way that’s as far from her psychological make-up as possible, so I’m beyond curious to see where this new development will take her. The huge cliff-hanger at the end of this book is bound to have me break my own rule about putting some space between books in a series to avoid the danger of overload: in this case I cannot wait, not too long. When Ashley Capes contacted me concerning this book I was eager to accept the task, since I greatly enjoyed his City of Masks. 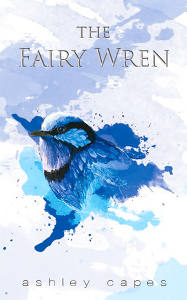 I was warned beforehand that The Fairy Wren belonged to a different genre, so I was eager to see how a change of style and background would come across in his writing: it was different, indeed, to the point that I’m quite puzzled about how to classify this story (mainstream with a dash of fantasy is the closer I can come to it) – but despite this little obstacle, I liked the book quite a bit. Paul Fischer is the owner of a struggling bookstore in the Australian city of Stony Bay: clients are few and far between and like other businesses along the street, Stony Bay Books is threatened by an incoming rent raise – a plot by the unpleasant and greedy lease-holder to evict the current shopkeepers in favor of more promising clients. This is not the only weight on Paul’s shoulders: his wife Rachel left him a few months before for another man, and his repeated attempts to contact her and mend the rift have been met with a restraining order. Family and friends advise him to let go and concentrate on the shop and its survival, but Paul seems at first too dispirited to do anything about it, until something changes: he receives strange phone calls he’s certain are from Rachel, who must be trying to contact him; a mysterious runaway child literally lands on his doorstep and the titular fairy wren appears in his garden, seemingly intent on conveying an urgent message to him. This series of unrelated events effects an extraordinary change on Paul’s listless attitude: he confronts the lease-holder head on, to the point of physically assaulting him, and he starts to take a more pro-active, or rather daring stance in his life. This does not mean that he emerges as a new, better man, though: he’s still prone to blunders and there are instances where he defies both the law and common good sense in such a way that it’s legitimate to wonder if he’s not lost his mind or entered into a different dimension, one where little birds communicate with him, leading him on a quest that will have unforeseen results and will uncover strange happenings. Paul Fischer’s journey is a peculiar yet compelling one: clues add up in an intriguing way, and despite the down-to-earth quality of the events (let’s not forget I’m a speculative fiction addict!!) I felt the need to know how the story worked out and how the characters would come through. Ashely Capes shows he’s a convincing storyteller, no matter the genre he works with or the writing style he adopts: even in this “mundane” tale, he managed to keep my attention focused, which resulted in a quick and pleasant read. One of the details I most appreciated was the fact that there is no definite “happily ever after”, that some outcomes are left in a state of flux with no certainty about what the future will bring – and yet there is a clear change in the atmosphere, and in Paul’s attitude toward life: a glimmer of hope has entered the equation, and altered the rules, showing how something small, indeed as small as a wren, can make a big difference. If you’re looking for a quick, uplifting tale to carry you through the holidays, this is indeed the book for you. Interstellar is without doubt one of the most anticipated movies of this year, and certainly a controversial one, at least judging from the divergent opinions I’ve read on the subject. After finally seeing it, I feel compelled to add my voice to the discussion. The story. In a not-so-distant time in our future the Earth is suffering: repeated crop failures have forced the population to rely solely on the cultivation of corn, whose fields extend all over the place. Dust storms plague our planet and there are several indications that even corn might not be long for this world, so that humankind’s prospects of survival look quite bleak. What’s worse, people’s mindset has changed: concentrating on the needs of the planet, they have stopped to look outward, even negating the evidence of the space program and the moon missions – labeled as complicated hoaxes – to keep humanity from wasting energy on anything non directly concerned with immediate survival. NASA, now turned into something of an underground movement, enrolls former astronaut Cooper for a mission through a wormhole located near Saturn, in search of a new home for the human race in one of the three maybe-viable planets located beyond the portal. I’ll say up front that I liked the movie, even though I think it might have been shorter, tighter and less wordy: my impression is that the creators had been given free rein with the production and they choose to exercise their right not to edit. Nonetheless, I was able to sit back and enjoy the ride despite the drawbacks I mentioned, probably because I went in with low expectations and therefore suffered no disappointment: I’ve often wondered if part of the reason for the negative reactions I’ve read comes from the huge hype mounted around this movie and the equally huge burden of expectations that went unfulfilled. The movie’s visuals are indeed exceptional, and the soundtrack from Hans Zimmer a perfect complement for them, even in its loudest moments: the choice of respecting the reality of total silence in space contrasts dramatically with enclosed-space scenes where dialogue and music stress the action. The emotional impact provided by the environment of the two visited planets is undeniable: first the water world, with its immense ocean and huge (very huge!) destructive waves that provides both a dramatic twist and a nerve-wracking situation; then the frozen world, with its endless wasteland and the crushing sense of devastating loneliness. The Earth as we know it is indeed the product of a series of serendipitous occurrences, and those visits to extra-terrestrial environments brought more clearly home the awareness of both the uniqueness and the fragility of our home. Despite these stunning visuals, though, my attention was focused more by the human factor in the story: the four people leaving for the mission are ready to sacrifice everything for the sake of humanity, accepting the heavy burden of separation from their loved ones and the added load of relativity with its accompanying difference in time-flow. When an unforeseen circumstance stretches that time into decades, it’s impossible not to identify with Cooper’s despair at the knowledge of the unsurpassable gulf stretching between himself and his family, or to remain detached when he tries to reach out to them through impossible odds (I know this last sounds cryptic, but to say more would be a spoiler…). Interstellar, however, is not immune from flaws. The human factor I mentioned above is unfortunately diluted by long-winded speeches that give you little about the person represented on screen, rather favoring a sort of stereotype that clashes with the wide scope of the movie’s story: so we are presented with the bold, selfless astronaut; the great professor’s daughter; the expendable scientists, and so on. While I understand that some tropes are unavoidable, I would have expected more from these characters: in particular I would have expected to be surprised, and not to anticipate a few behavioral patterns even before they appeared… Strange as it might sound, the best developed characters are the two robots assisting the Earth explorers: their role was probably created with light comic relief in mind, and yet at times they come across as more human and relatable than their flesh-and-blood counterparts. Story-wise, the stated need to maintain scientific accuracy, translates into detailed explanations that often slide into info-dump: one such case is that of the scientist explaining to Cooper (who is an astronaut, for pity’s sake, and should already be aware of the concept!) the theory of wormholes through the classic example of Point A and Point B drawn on a sheet of paper, whose ends are superimposed to exemplify the shortcut offered by the phenomenon. I understand how the creators wanted to reach as wide an audience as possible, but I can’t shake the feeling that one of the factors coming into play was the… lack of faith (for want of a better word) in the viewers’ ability to take mind leaps and accept such wonders without need for extensive footnotes. The same fate befalls the first part of the movie, where we spend almost an hour on the conditions of planet Earth: again, I gathered the impression that the authors wanted to drive the concept home beyond any possibility for doubt. Even the less sci-fi-oriented spectators would hardly need so much time devoted to the subject, and therefore those scenes seem to slow the pace of the story, making it appear unnecessarily heavy and heavy-handed. Authors – no matter the medium they chose to express themselves – should have more faith in their audience and its inherent ability to reach out and fill the gaps, because that kind of exercise is fun and entertaining. It’s extremely gratifying when viewers/readers become aware of the author’s trust in their powers of understanding, as is equally frustrating when they realize they are being spoon-fed. The narrative part of the book is indeed interesting and fast-paced, once the necessary introductory material and back-story have been dealt with, and as soon as the events start to roll, and take on the appearance of an unstoppable avalanche, the reading becomes almost compulsory and gains added speed through the author’s choice of going back and forth in time (even when it’s a short time frame) to show how small events in the past have come to impact those in the present and are leading toward the narrative climax. There are several excursions into branches of the occult culture, like numerology, that make for a fascinating reading, even for someone as skeptical as myself. Where the book did not work for me, unfortunately, was with the characterization: apart from the frequent head-hopping and several typos, that could prove quite distracting at times, I could not get a sense of the various players, both main and secondary ones, as people – to my eyes they appeared more like props put there to carry the story, and as such they were not invested with the qualities I usually need to take an active interest in them, to care for them. The majority of the character building rests on long dialogue exchanges that seem aimed more at broadening the reader’s understanding of the occult sub-culture rather than at the fleshing out of the people present on the scene. Even when personal details were added to the mix, it happened in a “telling” rather than “showing” mode, and that did little to deepen my knowledge of what makes these people tick. Detective Brian Kane, for example, is described as a gruff man with a strong down-to-Earth tendency, who finds it extremely difficult to accept the information provided by his counterpart, FBI agent Rowena Ravenwood: this was meant to show the antithesis between his disbelieving attitude and her vast knowledge of the occult world, gained through years of work in the special FBI branch that deals with such phenomena. What I did not like in this representation was Kane’s excessive use of colloquialisms that to me felt both unnatural and contrived, and not at all like an organically ingrained speech pattern. Ravenwood, on the other hand, was given the task of pedantically “educating” Kane, falling prey to long, drawn-out explanations to which the detective replied with repeated requests for clarification and declarations of skepticism that in the long run proved somewhat irritating. Ravenwood’s long-suffering patience and her considerations about Kane’s on-off “inner Teddy Bear” soon followed along the same route, and unfortunately all these elements prevented me from enjoying the story as I had wished. 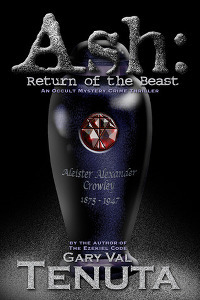 Despite this purely personal misgivings, though, the novel offers a quick, engrossing read – with the forewarning that it contains strong themes not recommended for the very young and the squeamish: if horror, supernatural and Lovecraftian-like creatures rising from the darkest depths are in your chords, then this book is certainly for you. There has been an influx of dystopian novels recently, most of them centered on YA main characters, with an almost mandatory focus on teenage angst and love triangles, to the point that I’ve been somewhat driven off the genre because of this depressing… sameness of offering. 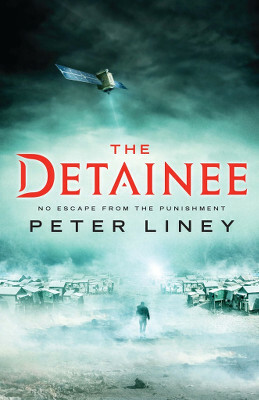 So when I started reading Peter Liney’s The Detainee I was pleasantly surprised to discover that this fascinating book, whose narrative drew me in instantly with its powerful and lyrical writing, was about older people. Imagine a not-so-distant future in which garbage is dumped away from urban sprawls, like the island where the action takes place: here rotting trash piles up in stinking mounds and creates pockets of flammable gases and corrosive pools. Now imagine that this wasteland is peopled by the old, the infirm, the unwanted – just like so much trash, the citizens who are not longer useful or productive are dumped here to die, out of sight, out of mind. And not just them: children and teenagers are sent to the island as well – those who have become a financial burden for their parents, or those who are considered unredeemable by society. A satellite network keeps everyone there preventing any attempt at escape, stunning or killing those individuals who break the law. As if this weren’t enough to paint a chilling picture, the elders live in abject terror of foggy nights, because on those nights – when the satellites are virtually blind – bands of blood-thirsty and drugged youths raid their village to maim, torture and kill the elders, pointed at by government, media and the island’s drug-lords as the culprits for the social upheaval that brought them there. What we see here is indeed the antechamber of Hell, a place where the borders between inmates and wardens, victims and torturers, are so blurred as to be nonexistent, a place without laws, hope, compassion. There’s a scream inside us all we save for death. Once it’s out, once it’s given to the world, there ain’t no going back on it. It’s time to let go, to release your fragile grip on life. Otherwise, God’s just going to wrench it from you. The narrating voice is that of “Big Guy” Clancy, the main character: once a powerful gangster’s enforcer, he’s 63 and dealing with the painful awareness of the indignities, big and small, of growing old, especially on this island where survival is not just a matter of strength, health or willpower, but of luck – the luck of not being one of the victims targeted by the raiders on foggy nights. Despite his violent past Clancy still holds on to some remnants of humanity he tries to suppress, even from himself: when we meet him, he’s listening to the hopeless cries of the latest raid’s victims, knowing he’s safe for this time, blessing his luck – but on the background I could hear the better part of his soul rebelling against it all. It’s therefore not surprising that he will find himself headed for massive changes through a chance encounter that will pull him away from the path of simple survival toward something… different. I believe the main theme of the book is hope: what happens when it’s stripped away, and when it’s glimpsed again like a blurry mirage you don’t want to believe in. With nothing to hold on to, the older people have come to some sort of inert acceptance, shutting out cognitive processes in terror when danger grows near, only to go back to the usual routine when the storm is past. In Clancy’s own words It’s as if the longer we live like this […] the more we regress to what we’ve always been: dumb animals. Eating when we can, sleeping when we can, mutely accepting those who occasionally come to cull this sickly old herd. In such a state, the barest glimmer of hope can be more painful than the killing blows from the young attackers, because it re-awakens feelings and thoughts that are best forgotten, as another islander puts it in one of the best sentences of the book: “You know, I can take the bars; it’s the patches of sky in between that break you”. Lack of hope, and of any alternative, lies at the roots of the younger people’s behavior as well: robbed of their childhood by the circumstances that brought them to the island, they become victims of a peculiar twist in Stockholm’s Syndrome, turning into torturers to forget their status as victims. This animalistic regression is more deeply rooted than the similar phenomenon occurring in the older generation, because these children and youths have far less good memories to hold on to than their counterparts. And here is where one of the less believable narrative threads occurs: because if a reversal of such a situation is indeed possible, the apparent swiftness in which it occurs in a specific instance left me dubious, as did a few others I cannot list for fear of giving too much away. In these cases my suspension of disbelief did falter, but I also have to admit that they were just passing moments, because The Detainee is the kind of story that does not allow you to come up for air too often, and holds you in thrall from start to finish. Not a “happy book”, not by a long shot: there are horrifying moments and glimpses of that twisted micro-cosmos that chilled my blood. Yet it’s written with such a deceptive simplicity that it draws you in, until you see hidden depths that make you think. And I could not ask for more. 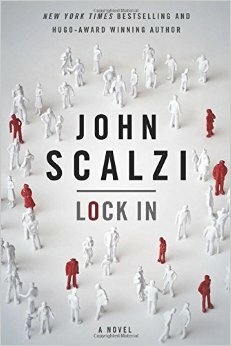 A new book from John Scalzi is always a treat, but for this one I had even higher expectations, both because it promised to be different from the author’s usual “stomping grounds” and because the short story “Unlocked“, released a few months ago, showed tantalizing glimpses that I could not wait to explore. The premise: a virulent strain of flu has swept the planet, killing millions in its wake and leaving one percent of the affected population “locked-in” in their own bodies, which means their brain and consciousness are active, but unable to connect to the body and therefore reach the outside world. With time, a partial solution is found for the Hadens – i.e. the people so affected, named after the best-known flu victim, the First Lady: a brain implant that enables them first to participate with others in a virtual community (the Agora) and later to interact with the rest of the world through android simulacra, or “threeps”. When the novel opens, a new frontier has been reached: some of the flu survivors have undergone such a change in their brain structure that they can interface with Hadens and so offer a flesh-and-blood host – an Integrator – able to experience the world in a more tangible manner. The novel is narrated from the point of view of Chris Shane, a Haden, who starts the very first day on the job as an FBI agent by being called with senior agent Vann to the scene of a murder involving an Integrator, and it’s clear from the start that there is much more to the story than meets the eye. The investigation brings Shane and Vann along unexpected paths, toward the discovery of a deep-rooted conspiracy involving several levels of the business and political scene, one that could dramatically affect the Haden population worldwide. I’ve often praised John Scalzi’s deceptive lightness in style and storytelling, and “Lock In” is no exception, more so than other books: this fast-paced, dialogue-intensive novel offers an inside view on the social changes occurring after such a devastating event as the epidemic, but also a series of reflections about disability and the way people react to it from both sides of the equation. The book outlines quite clearly the range of social reactions toward the victims of such a large-scale event: in the immediate aftermath of it, when the emotional impact is still strong, solidarity reaches its highest levels, only to decrease as times passes and habit and familiarity set in, with such consequences as the perception of Hadens as a collective burden that’s becoming increasingly hard to bear. The strength of the novel comes from the ease with which this situation is outlined: Scalzi does not preach or lecture, but simply shows how this affects society with a series of subdued, almost off-hand scenes that nevertheless deliver a meaningful message, like the detail about threeps not being allowed to take a seat in public places like bars and restaurants, since android bodies have no need for rest and comfort and it’s considered a waste of space – what remains verbally unexpressed, but is glaringly obvious, is that threeps and Hadens have come to be viewed as possessing fewer rights than the average citizen, and that there is no allowance for their feelings when their social interactions are forced into awkward positions, both in the mental and material sense. Hadens have almost become non-persons, or second-class citizens. On the other side of the fence, Hadens embrace differing viewpoints concerning their situation: people who were so affected after living a normal life span are more inclined to find a way to still be a part of the wider social tissue, while those who were locked in at a very young age (as one of the characters who was affected before birth), and therefore have little or no ground for comparison, don’t see their affliction as such, but rather as a different way to be a human being, to the point of refusing the use of threeps, preferring the virtual interaction of the Agora to more “hands-on” relationships. They don’t view themselves as sick, and of course refuse to be cured in the event that a solution to the lock-in problem is found (a possibility that is explored in the course of the story). Considering the non-person treatment I mentioned above, it’s hardly surprising that the Hadens who have less experience of the outside world would prefer its virtual equivalent, a place where they can be whatever they want, with no limitations. So once more I have to praise John Scalzi for his effective blending of entertaining narrative and thought-provoking elements: for me that’s become one of his trademarks, and one that I’ve come to expect from his books.